Tana Toraja, high in the mountains near the center of Sulawesi, is one of the few places in Indonesia where you can still see a unique culture that keeps its traditions alive, and not just for the benefit of the tourists. In the high mountain valleys, you will see traditional tongkonan houses set in terraced rice fields. The culturally distinctive Torajans are perhaps most well known for their elaborate death rituals, which includes funerals that can last for several days, followed by burials in rock tombs. 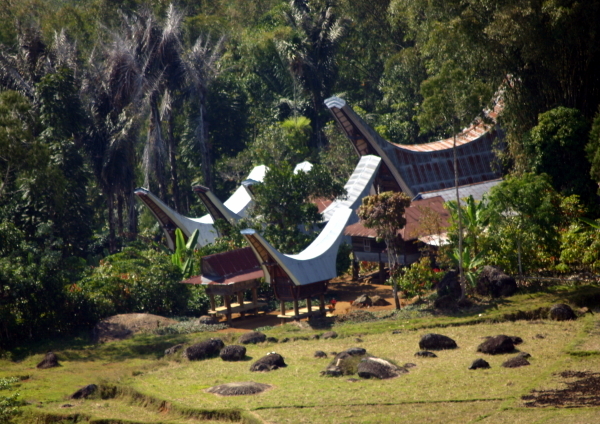 Thanks to its high altitude, Tana Toraja has a rather temperate climate. While days can be warm or even hot, nights are usually so cool that none of the hotels in the area have air conditioning. The cool dry season runs from March to September or October. If you want to see a funeral, the best months are August or September. This is when the farming people of the area have free time before the rains arrive in October. While some guide books suggest that Toraja is already over-run with tourists, I practically had the place to myself in early October, and the truth is that there is very little in the way of tourist facilities in the area. You'll find only a small number of locally operated hotels to chose from, and there are few restaurants or other shops catering to travelers. Still, the unique culture and friendly people make a visit to Tana Toraja worth the effort it takes to get there.